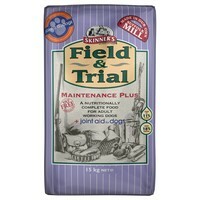 Skinners Field & Trial Maintenance Plus Dog Food is a nutritionally complete food that has been specially formulated to include joint aid for dogs which can help maintain healthy joints and flexibility of movement throughout your dog’s life. Made with easily digestible British chicken meat meal, the food contains high levels of essential fats and oils to help maintain a healthy, glossy coat whilst a mixed blend of cereals provides a good source of carbohydrates. Skinners Field & Trial Maintenance Plus is ideal for working dogs undertaking light to moderate work or at rest in the close season. It is also perfect for older working dogs that can benefit from the inclusion of joint aid for dogs. Great product. I feed my 12 year old Springer, 2 year old Springer and 18 month old Viszla on this and it suits them all. My neighbour now feeds her very fussy German Shepherd on Skinners Maintenance too - clean bowls all round!